Over the weekend, I was in Subic Bay, about 3-4 hours drive out of Manila, to watch the K-Swiss ASTC Asian Triathlon Championship. It was my first time to visit this town, which was the location of a major US Navy facilities, also known as US Naval Base Subic Bay. As you enter the town, you can feel that the Americans were there. Not that I am an expert in anything Americans, nor anything Philippines, but, it’s so obvious. The roads are wide, electrical poles and cables are orderly, the STOP regulations for all vehicles at intersections are obeyed, and the pedestrian walkways do exist! I captured the picture above as we were walking to the venue of swimming leg and T1, at Dungaree Beach. In the picture, you can see the fence which surrounds Subic Bay International Airport, which used to be the US Naval Air Station. This is another version of public transportation here, known as tricycle. The side car ideally can fit 4 people, while 2 people can sit on the motorbike behind the driver, making a total number to 6 passengers! To be completely honest, their presence can be a total pain in the a**, as they go very slow and think of themselves as a motorbike, without realising that their width is almost like a small car, making it difficult to overtake on small roads. Their habit of stopping everywhere, without giving any signal, plus their inability to see what’s going on their right side (right side view mirror is on the motorbike itself?) make the matter worse. A couple of days ago I went to visit The Tops at Busay. As the name suggests, one can have a bird eye view or city lights (if you visit in the evening) of Cebu. I personally think this place is overrated, as you can actually have the same view from other spots, without paying the entrance fee :-). However, this place has a lot of potentials, if only it would be developed further with proper amenities, such as nice cafes or restaurants, instead of some makeshift drinks and snacks vendors. I like the curved architectural shape of the resting / eating area, with its repeated circular sections, making it an endless varieties of shots possibilities, just by centimeters reposition of camera angle. Apart from the misspelling (How’s my driveng? ), I wonder whether this kind of car paint will ever happen in native English speaking countries? First of all, my camera is back sparkling clean, just before the weekend, yay! Right on time to shoot The National Age Group Triathlon Race over the weekend. Above is a shot I captured yesterday on the way from Sogod (where the triathlon took place) back to Cebu. Standing just outside the moving jeepney, the guy was holding on to the roof with left hand, while the other hand was holding a bunch of balloons. It reminds me of one of my favourite animation movies, Up (well, except, of course, the jeepney didn’t fly away :-)). Sari sari (in Tagalog means variety) is small convenience stores which can be found in neighbourhoods all around Philippines. They are mostly privately owned. Some of the them are free-standing huts, while some are operated from inside the shop owner’s house, as it’s actually occupy 1 room of the house. 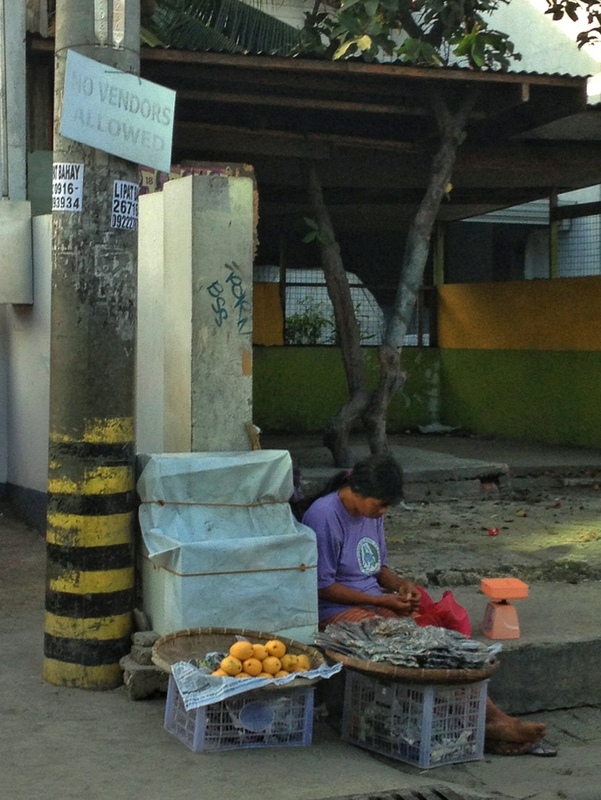 They sells basic / everyday necessities, from cooking oil to soap, candies to cigarettes, etc. The goods are normally displayed by the large plastic-covered windows or metal-barred window. Rather than selling a whole package, in sari sari stores customers can buy the commodities in small amount. Therefore you can see small sachets of shampoo, 3-in-1 coffee, etc. The average spending per person in this kind of shop is around 8 pesos (around 2 US cents).